Yesterday afternoon we were again sweltering, but there was a promise of rain later in the day. Actually the weatherman was forecasting some strong thunderstorms with wind and he wasn't kidding. It all started about 2:00 in the afternoon. The shop here closes at 3 p.m. so by the time people needed to pull their rigs out of the service bays and over to their sites, it was a regular downpour. But the good part about that is that it dropped the temperature about 20 degrees, so who cares if we got a little wet? Last evening the representatives from MASA (Medical Air Services Association) invited people in the campground to a free dinner at the one restaurant in Red Bay. We are members and it was a free meal, so we went! Our neighbors had decided to go, so we offered to drive them. They are here with their rig without a toad, so it made things a little easier for them. We enjoyed a nice dinner and listened to the reps dispense information about this medical evacuation service. We were disappointed that we did not yet have a call setting us up for service. Our appointment is Thursday, but we had been in begging them to get us in just a day early so we could be on our way. We wanted a little cushion so that we could easily drive back to Indiana and be present for Mom and Dad's 65th wedding anniversary party on Saturday. Everyone is going to be there. We will have all the kids, grandkids and great-grandkids. It should be fun. We got up this morning early as usual and even though we didn't have a service time/day, we always make sure we are ready before 7 a.m. That is the time things start moving around here and we wanted to be ready should someone call. Well, at 7:05 that call came. Jimmie asked if we would like to get in early. We said, "Heck, Yeah!" So he told us to get to Bay #3 as soon as possible. Terry did the outside duties as I picked up the inside and pulled in the slides. We were in there by 7:25. Our bay #3 technicians were Marion and Daniel. They were very nice and very helpful and went to work immediately. I put a couple dog biscuits in my pocket and headed to the lounge. It's a good thing I was prepared because I met Gunner and Sadie who each got cookies and later Fred and Molly. Three schnauzers and a yellow lab. What great doggies. While we waited the guys worked hard at getting our work done. We didn't have a lot to do, but it was important and needed. And the weather cooperated a bit and it wasn't as hot as it had been. They broke for lunch at 11:30 and we went to the motorhome to fix our lunch. There wasn't much left to do and within a half hour of returning from lunch the guys were finished! What a break for us! We knew with the right crew it would go quickly and it did! We got the motorhome prepped to run again and backed out of the bay and returned to our site. Terry put some water in the tanks and we hooked up the car. Then we went over to the service office and paid our bill, $104. Cheapest we have ever gotten out of there. While we are no longer under warranty, they do warranty their work and two of the items we had repaired had been worked on last year as well. Whoo Hoo! Next was checking out of the campground which was quick and easy and we were on our way! And it was only 1:30 p.m.! Course, the fun was about to begin because a strong storm cell was headed to Red Bay as we pulled out of the camp. Terry got on the computer and watched the progress of the storm and we stayed just out of its reach. We got on the Natchez Trace because there have numerous pullouts we could use if the rain got too heavy. As it was, we had one strong rainstorm but we were protected from winds. We did get stopped, however, in Tennessee. While on the Trace, I was able to see ahead to brake lights and cars stopped. So I slowed down. It became obvious as we got near that the road was blocked from a tree which had been struck by lightning. There were men working on the branches, etc., and throwing log chains over the trunk in an attempt to drag it off the road. That wasn't working too well, but we certainly appreciated everyone's efforts. It wasn't long before the actual Trace crews showed up and someone pulled out a chain saw. The guys who had been there started working at clearing the branches and short logs being cut and it was a short time before we were able to start again. It was teamwork at its finest. No one got upset, everyone pitched in and got the job done. We continued to drive and on the Trace we saw a lot of deer, wild turkey, and turtles on the road. I dodged all the turtles as did everyone else. At the north end of the Trace, I took the exit ramp toward road 100 and as I leaned over to check the traffic coming in from my left, I saw a tan flash and when I abruptly sat up, I saw a deer glide in front of the motorhome! I missed him by an inch maybe. I can't see how; he wasn't moving fast, but someone was watching out for him! 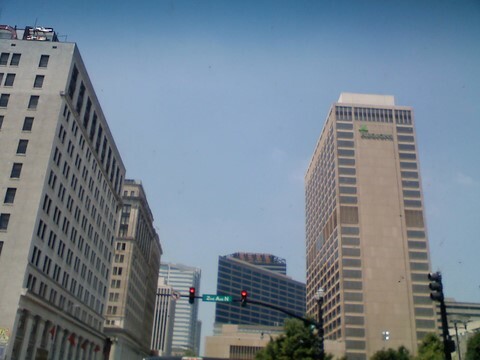 We hit Nashville right at rush hour, but didn't have as much traffic as anticipated. We drove on north to Cave City and are camped at Singing Hills. We have been here before and it works for overnight. We will probably make it to Warsaw tomorrow. In other news, our daughter was flying in with our grandson from Philly to Detroit to Indy. The Indy leg was cancelled and so she picked up a rental car in Detroit to drive to Goshen. She is on her way and I pray for her safety in getting to the house tonight. If you are a follower of the TV shows like, "Flip this House" or "Holmes on Homes," you can appreciate our little side trip yesterday to Aberdeen, Mississippi. This is the hometown of Billy Brasfield, known in the make-up world as "Billy B." He has made a name for himself as a professional makeup artist to the "stars." He is a native of Aberdeen, Mississippi, just about 20 miles south of Fulton, Mississippi. Billy B left Aberdeen to "make it big" which he has done, perfecting the art of makeup for the likes of Lady Gaga and Wynona Judd. He has recently embarked on a project in his hometown which surprises even himself. He left Aberdeen never intending to return to live, but somehow this little town tugged at his heart and he came back to find many of the fine, older Victorian homes in disrepair. Having a flair for the flamboyant, Billy B has taken the town's movers and shakers under his wing and pushed for rebuilding and re-establishing the town, "one house at a time." He has purchased numerous houses on the cheap and sets out to renovate them into their former glory, then rents or helps finance homes for local buyers. His efforts have landed him a successful television show on the HGTV network known as: "Hometown Renovation." We have been fans, since Terry is a Mississippi native and always interested in home construction. We took a drive down through the town today. We did the architectural driving tour, but it was a little difficult to follow and I'm sure we missed a lot. We did get to see quite a few lovely examples of Victorian architecture. I didn't take a lot of pictures as we tried to find some of the houses BillyB has showcased on his show. It was a lovely town and it is amazing that this man is focusing on rebuilding the town where he was raised. Last year he began a drive to save the "Five and Dime Store" on the Main Street. Quite a lot of money was needed, something like $350,000 for purchase and renovation. He was able to convince his friend Wynona Judd to make a personal appearance in one of the historic homes in the town and have dinner with many of the town residents who purchased tickets to attend. This event was recently aired on the HGTV channel. We enjoyed our visit to Aberdeen and on the way out of town we stopped to take a picture of a tug and barge going through the Aberdeen lock. We continued on our way back to Fulton through the town of Amory. Amory has a locomotive on display in their park on the main street. This locomotive brought President and Mrs. Roosevelt to the town for an appearance in 1934. The engine is massive and was eventually retired and given to the town. It was close to lunch time when we were in Amory and we found an interesting little restaurant called "Bill's Hamburgers" where we stopped and ate. It was interesting and the burgers were very good. Tomorrow we will be leaving Fulton and heading up to Red Bay to await our service appointment. Hopefully we will get our work done quickly and be on the road by mid-week. We have been sitting in camp a good part of the days while we are here in Fulton because it is too hot to spend much time outside. We've toured the downtown area which is not too large. What is surprising is that they have many restaurants, not only fast food, but larger restaurants and several good hotel chains. I don't know why they have all this in Fulton. It is pleasant here, but not sure what the draw is except that it is just 17 miles from Tupelo, so I suppose if a big event is going down in Tupelo and there aren't enough hotel/restaurant spaces there, people would come here for the night. I had reported earlier about the tornado damage in Belmont, Mississippi, over close to Belmont. Last Thursday we drove south out of Fulton just to enjoy the countryside and we drove upon the town of Smithville. . . or perhaps I should say, the FORMER town of Smithville. On April 27, 2011, there was a tornado of epic proportions. The cloud was three miles tall and the swath the twister cut was a half mile wide--right down the main street of Smithville. How many times have you watched coverage of tornado damage of lesser class storms and thought how horrific it was. This was a full-blown EF5 with winds of 205 mph! I am not kidding when I say that nothing is left of the main street. 140+ houses were leveled, at least 4 churches that I saw on a map, 14 of 16 businesses, and 14 people killed and 40+ people injured. The school suffered major damage to multiple buildings and most of the roofs were tarped up. The main street curves sharply to the north and that is where the twister exited across the highway and tore up woods on its way out of town. The Sheriff's office is now in a trailer and some temporary FEMA houses have been set up. There are signs up for "Food" and "Water" which would be difficult to obtain from normal sources. All new telephone poles sit on the north side of the road and bulldozers and other heavy equipment are doing their jobs of clearing debris and removing trash. A burn pile has been established on the south side of town to get rid of some of that trash. Crews are working daily to get the land cleared. Temporary clinics have been set up to accommodate the needs of residents who live in houses further off the main street. Everything north of the main street to the Tenn-Tom Waterway is gone, but a couple blocks off to the south, some houses with minimal damage remain. What a tragedy. The only thing we could relate it to was the 1965 Palm Sunday tornados back in Indiana. This was a stark reminder of the destructive side of Mother Nature at her worst. I took many pictures, but we don't know what stood in these pictures. You can see driveways in one part and foundations where house after house once stood. I looked on Google Earth to get a look at what the town looked like. It was devastating to this little town. Today we drove through it again on our way home from Tupelo. The work continues and a few more buildings have been taken down because there was no way they could be restored. Please pray for the people of Smithville. Last Friday we had visitors at our camp at Piney Grove. Cousin Gary and wife Jo came by to visit. They had originally planned to park their Prevost right beside us and had the site reserved, but they ended up cancelling their reservation. Gary's Mom died just a month ago and they decided to spend the weekend with his sister Shirley. We had visited Shirley earlier in the day thinking we might catch Gary and Jo, but they were out shopping. So it was a surprise when they knocked on the door. We got to visit and find out what all was happening with our families. We normally stop at their home in Louisiana on the way out of Texas, but because of spring storms, we went north instead of east when we left. The reunion was Saturday and we had a small but faithful crowd. We do hope more of the relatives hear what fun we have every year and plan to make the effort the next year. We have lost many family members this year and two within the last month, so we are hopeful the younger family members will encourage others to come next year. We stayed at Piney Grove an extra day because we needed to take the motorhome over to Bay Diesel in Red Bay on Monday. They were going to check the error codes to try and see why we got a check engine light upon pulling in to Piney Grove. As it was, they were not able to determine anything. There did not appear to be any old codes or anything that would explain the message. Chris did say that if it happens again, we need to find a CAT dealer who would have the comprehensive computer diagnostic software in order to pinpoint the problem and fix it. He had suggested to Terry earlier in the week that he check the overflow reservoir and put some distilled water in it. When Terry checked it, he was able to put about two liters in it. A low fluid amount there will trigger the sensor to give the "check engine" message, so it is possible that was the problem. While we had it there, I started asking Chris about an oily smell I was getting whenever I would apply the service brakes. He immediately suspected an seal in the oil-filled hubs. Sure enough, the seal was broken and fluid was spilling over the brake shoes. That was fixed, new brake shoes fitted and the other side got new brakes. He also cleared up some questions I had about some clunking and pulling I was experiencing when applying the service brakes. He was able to help that a bit as well. So even though nothing was found wrong with the engine, we did get some other issues taken care of and that was fine in my book. We have not been able to get into Tiffin Service early, but we have our name on the list. We are hoping to get in even a day early which will make it easier for us to get back to Warsaw with time to spare for Mom and Dad's 65th wedding anniversary party. All the kids, grandkids, and great-grandkids will be there, so it will be a festive occasion. When we left Red Bay, we drove over to Tupelo. We wanted to put some miles on the coach and make sure if we experienced any problem, we would be able to address it. We camped at the Natchez Trace RV Park. We have been there before and it is a Passport America park. It is adequate and we stayed two nights and did some sightseeing around Tupelo. We probably would have done more, but it has been 95-97 degrees and we just prefer to stay in the motorhome where it is cool. This morning we drove over to Fulton, Mississippi, and we are camped at the Whitton Park Campground which is another COE park. It is heavily wooded, but wouldn't you know. . . our site has about two feet of clear sky in front and it was all Terry needed to get the TV satellite antenna locked on. He is happy about that. I could take it or leave it. The Datastorm is under too many trees to even get a GPS reading, but our aircard is working well, so life is good. We went out after lunch to explore, but there isn't too much here in this town. We did go to the waterfront. There is a bike/walking trail that runs for a couple miles along the Tennessee-Tombigbee Waterway, so we took a couple pictures. On the way back to camp, we stopped at the historic center which is a very nice building with a history display of the building of the waterway and about how it has changed commerce in the northeast part of Mississippi. We will be here for a couple nights before moving on to Red Bay. We want to be in there over the weekend so that we get a full hookup spot and can get ready for our service appointment. We left this morning and drove over to Red Bay, Alabama, the home of Tiffin Motorhomes. We wanted to connect with Bay Diesel, the business where we were directed by Freightliner. We met the owner, Chris, and he asked a couple questions and said that we could bring Phaeton Place over Monday morning. MONDAY MORNING! WOW!!! Really didn't think we would luck into a service appointment that quickly. He is pretty sure he can help us out and also gave us something to check before we drive it over. We did check our coolant and Terry added a bit. That could have been the problem, although we don't think it was low enough to cause a problem. We feel confident they will be able to find the problem Monday. We also drove over to the campground and talked with the new people there. We really miss Marsha and Rod, but their stint at the office there is over and they are on their way to their vacation home in Custer, South Dakota. We talked with Peggy in scheduling and she told us who to talk to about getting an earlier appointment date at the service center. We talked with Jimmie and he told us what to do and we got that accomplished while we were there. So our time in Red Bay this morning was very productive and it was a worthwhile effort. On the way over there we saw this manufacturing building in Belmont which was destroyed by tornados on April 27, 2011. I think that's the same day as the Joplin, Missouri, tornadoes. They had multiple vortices and many houses were hit as well as trees and buildings. When we were here in May for Aunt Teen's funeral, we saw where the tornadoes came through the Natchez Trace. It was closed for a while after the event due to downed trees. We saw them in May and saw them again the other day. The trees now have been cut up, but we noticed new trees downed and what looked like more recent damage than last month. While we were talking with the gals at Red Bay about the tornadoes, they said another storm just two weeks ago was responsible for the newest damage. We have been here when there have been bad storms. They certainly have their share. On the way back, we drove along the Tennessee-Tombigbee Waterway. Forty years ago when we visited the area, they were building this large, long canal. The picture of the lock is at the end of the lake we are camped on. We came back to the motorhome late this afternoon, so have just been hanging out. We did go down to the gate and register for Sunday night. That way we can move over to Red Bay on Monday instead of Sunday. We thought that would be preferable in the event the coach shuts down on the way over and has to be towed in. Pray that doesn't happen! We left early for us this morning, getting on the road by about 8:30. We decided to go south out of Nashville and eventually pick up the Natchez Trace. We were in some traffic and we were navigating some intersections new to me in the motorhome. I was concentrating pretty hard on what was going on and people were driving absolutely crazy. I figure most of them were on their cell phones. Where the interstates I-40 and I-24 meet we got tangled up in some traffic. It was stop and go, but people were trying to change lanes and slamming on brakes, etc. I mostly try to keep a good distance because I don't want to have to make any panic stops. All of a sudden I start hearing some noise and thuds behind me and at that point I see parts flying through the air off to my left. We were about 6 lanes wide; I was in the third lane from the right. I hear this really loud thunk and feel something hit high up on the motorhome. Just then an SUV, a Ford Excursion I think, comes careening down the far left lane headed for the barrier. His right front tire is laying over almost flat to the ground. I'm thinking, "Nascar!" I see more parts flying, but I was looking straight ahead. You never know when someone would decide to just slam on the brakes to stop and look. There was no way for me to stop anyway to look at whatever damage may have occurred. Nothing had hit the toad and everything seemed intact, no driving difficulties, etc. Later when traffic thinned out we pulled to the side and Terry got out to inspect the coach. He could not find any knick, scratch, or dent! He found one mark on a window frame where he thinks it's possible a piece of rubber might have hit, but we aren't sure. I intended to get up on the roof when we got to the camp to check out the roof, but I didn't do that. Will have to check it out tomorrow. We got on the Trace about 100 miles south of Nashville and drove to our favorite lunch spot, the rest area on the north side of the Tennessee River. What a great spot to sit for a bit. We both got out this time and checked the coach and could not find any spot where it was hit. So we are glad for that. Once lunch was finished we watched the news a bit, then drove on to Piney Grove, just off the Trace near Burton, Mississippi. The camp sits on Bay Springs Lake which is on the Tennessee-Tombigbee waterway and we later saw a barge going through the lake. That is the first time we have seen that, although we knew there was barge traffic here. We did have a problem though. As we turned onto the road back to the camp, we were still about five miles out. I noticed a loss of power and looked down to see the "check engine" light on. Yuck. I told Terry, checked all my gauges, everything was perfect. We continued on but couldn't get over 1200 rpms. After a bit, the light went out and I instantly had more power. Once again before we got back to the camp, the light came on again, but eventually went out. Terry ended up calling Freightliner and they told him it sounded like one or both of the fuel filters. He told us to drive it on to Red Bay, our next destination. He thought it would make it there, but if it "redlined" it would shut down and we would have to be towed the rest of the way. Red Bay does have a diesel mechanic who can fix it. So we shall have an interesting drive on Monday. We are here for Terry's family reunion which is Saturday. We left Dale Hollow Lake early (for us) Sunday morning. 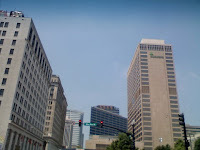 We had to be out by 2 p.m. and couldn't check into Nashville until 3 p.m., but we decided to leave early anyway. The campground was pretty full over the weekend with lots of wacky campers and we thought it better to get out and get our tanks dumped while there wasn't a line. Later in the morning there surely would be a line which we have seen here before and we wanted to avoid all that. We stopped at a rest area on I-40 and I got out my computer and started working on re-configuring the router for the aircard. It had been giving us fits and then stopped working altogether, so I took a shot at it. I got it up and running, so we got caught up on our reading and Facebook while we were there. We also ate some lunch before heading out. We just really needed to kill some time as we only had about 100 miles total to drive. When we drove into Seven Points campground on J. Percy Priest Lake, the attendant told us our site wasn't ready yet, but they were wrong. It had been vacated. We drove on around and unhooked the car, then we backed into our site and set up. Shortly after that it started blowing something fierce. I had read that there might be a thunderstorm and we did have some rain and wind, but nothing major. The best part of that is that the temps dropped from the 90's to the mid 70's! We got our laundry together and went to the laundromat. After a week at the lake without full hookups, we had a lot of towels, the bedding, etc., so we got that all done. But we will have to find another laundromat if we come here next year. We have used this one for several years, but it was absolutely filthy. There was no attendant, many of the machines had "out-of-order" signs on them and there were actually some unsavory characters hanging around. So we asked at the front gate and they told us of another that they are now recommending. Today we decided to go downtown. We have never been in downtown Nashville and we found a parking place and walked up and down Broadway. It was pretty neat actually. 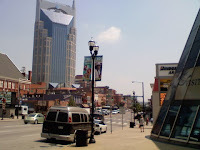 Some souvenir stores, lots of restaurants and some venues with live entertainment. 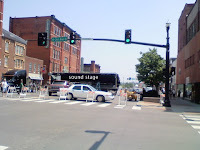 They are getting ready here for Music Fest and they were setting up sound stages on Broadway and on the waterfront. We decided to eat at Rippy's, which is a rib and BBQ place. We got a sampler platter which we split and brought half home. It was very good food and the place had a lively atmosphere. 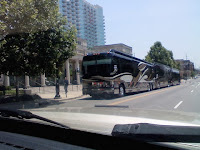 One thing we saw were custom Prevost buses. 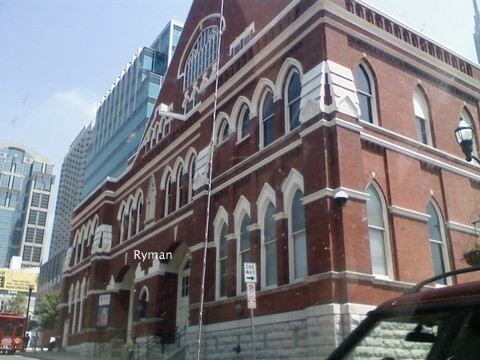 One was just down from the Ryman, two more were parked on Broadway in front of "The Stage," and three were in front of another venue area. One had the name Randy Atkins on it, but none of the others bore labels. I wonder what famous people were watching us as we walked by. We are thinking of going to the Hermitage tomorrow. I don't think we want to go back downtown. The traffic was horrendous and it is very hot. We are here every year, so we may go back another time. Great day with great friends. . .
Our friends, Tom and Carol and Sharon, invited us over to their houseboat for dinner last evening. I made some brownies in the morning to take and we also had a bag of chips and a bottle of wine. We were having a cookout and we were looking forward to a great time. We had about 15 miles to go by water, which takes at least 30 minutes if not longer because we rarely drive as fast as the boat will go. We like to go slower and cruise along enjoying the weather and the scenery. We left Sunset and drove to the state dock, just down from where their houseboat is docked and fueled up. Then we drove on over to the inlet where we found them lounging around on the deck. What a life! The houseboat is very nice. They have had it for 10 years and did a lot of work on it to make it comfortable and it really shows they have put a lot of care into it. W e floated in the water for quite a while enjoying the solitude of the cove where we were docked. The only problem was that Tom had been in the water feeding the fish. Little bluegills. . . now I'm not afraid of fish but it is a little unnerving having these little guys swim up to you in the water and nibble on your toes or tug on your swimsuit. I was a little more than annoyed at them because you never know when their bigger brother will decide to come along. We finally moved a little farther out into the inlet and they didn't follow us. Tom fired up the grill on the other end of the boat and we got out of the water and sat out there. We saw a snake in the water up toward the shore. He was probably a couple feet long and too far away to observe what kind he was, but he was content to swim along the bank. We visited during dinner and caught up with what everybody's kids are doing. When we all first met, we would come to the lake and bring our children and we boated all weekend and tubed and dock hopped together. It was great fun. Things change, though, and kids grow up and move on and have their own families and do their own thing. But we will always remember the fun times we all had at Dale Hollow Lake. As evening closed in on us, we decided to head back so we could get docked and the boat covered before dark. So we bid our friends goodbye. They were leaving today and we are staying until Sunday. Tomorrow we will pull our boat out and clean it up before putting it back in the storage bay. Days on the lake. . .
We got out early Tuesday and got all the stickers on the boat and trailer and took her down to the launch ramp. Flawless launch. She fired right up and has run extremely well. We took off going up river toward EastPort, but had to scrap that plan. Dale Hollow has been in flood stage for several weeks and there is just too much debris, limbs mostly, in the water. Since the EastPort leg is a river, more/less, it makes it hard to dodge all that stuff, so we turned around and headed for the main water. We are about 15 miles by water from the main part of the lake and we drove out to that taking in the beautiful lake scenery along the way. Very little is built down on the water. . . maybe a house or two that were "grandfathered" in when the lake was built. They are now allowing building up on the ridges overlooking the lake and it is interesting to see what has been built since last year. We took a ride over to Wisdom Dock thinking we might have some lunch, but their restaurant is closed during the week right now. We rode over to Eagle Cove where our friends Carol and Tom moor their houseboat, but it was gone. We figured they were out on the lake somewhere. I called, but had to leave a message. Later when I checked my phone, Carol had left a message telling me where they were docked. We headed back that way and stopped at the state dock for ice cream. While we were there, Carol and Tom drove up in their boat and we all chatted and ate our ice cream. They invited us back to the houseboat so we followed them back and I enjoyed floating around in the water and catching up with the news from the last year. There were several other couples there and we all enjoyed the visit. Later we headed for home and we were pretty tired by the time we got here. It is super hot here, in the 90's with plenty of humidity with plenty of sun, and that wears a person out. We fixed supper, took showers, and headed to bed. Yesterday we went out much earlier in the morning to try and get some lake time in before it got really hot. I believe, however, it was hotter than the day before although it was supposed to be a bit cooler. We rode past "Diver's Rock" which usually has more rock visible out of the water as well as a ridge of rock running out to the buoy at the far right. We did some dock hopping, checking out the state dock, Willow Grove, and Mike's Landing at Sulphur Creek before heading for home. Later while we were relaxing in camp, Carol called and invited us to a cookout aboard their houseboat this afternoon. So we are going to eat a light lunch and take off, eventually making our way over to their dock and chilling out with friends. It promises to be a good time!